It seems that every week in Big Ten play there is an exciting upset and some really close important games. This week was no different as Minnesota shocked IU. It's going to be a very interesting final two weeks, and come time for the conference tourney, I think virtually every game from Friday onward will be a toss up. On to the rankings, where you shouldn't crown IU just yet. 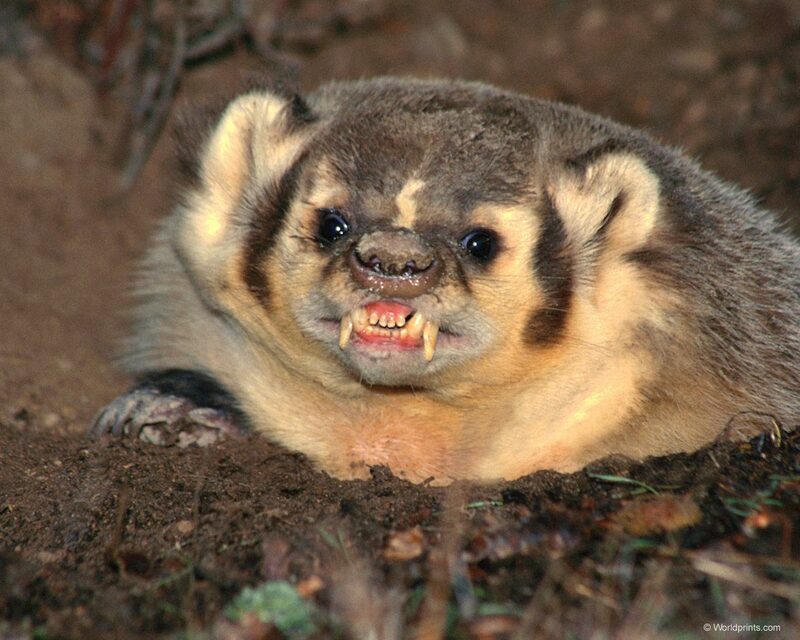 This badger looks even scarier than Bo! I mentioned last week that I thought Wisconsin would come from two games back to challenge IU for the regular season title (owning the tiebreaker, too). The Badgers have lived up to it by destroying Nebraska (you play the games on your schedule, so what if it was a light week?). They'll probably handle Purdue easily on Sunday, even if one of their best players has to shoot jump shot free throws. Hey, maybe some Boilers should try that, it couldn't hurt! Go Golden Gophers! That was a very fun game to watch, and two of IU's final three games will be real tests where they'll have to prove they are worthy of a top NCAA seed. I expect utter failure, of course. The Buckeyes had a great week beating Michigan State and Northwestern. They've now won their last three games (which include destroying Minesota) but face a huge test at Indiana on Tuesday. If they can win that and do well in the conference tourney, I see them moving up majorly in the NCAA seeding, possibly even as a two seed. Sparty had the week off to sulk after losing to OSU last weekend. Their road only gets rougher as they head to Michigan and then play Wisconsin this week. Lost those two and they'll be in a lot of trouble, but I'm sure their pedigree will still reward them in late March. I've ripped the Gophers a lot this season for underperforming, but for one night this week they were my favorite team. Way to pound the Hoosiers! For that, you get a BIG jump in the rankings, even though you're still the same team that lost to Iowa by 21 points. Michigan handled Illinois but then lost to Penn State on the road. Yes, the same Penn State team that hadn't won a Big Ten game this season. Wow, that is pitiful! Michigan has only two wins against a ranked (at that time) opponent in 2013 (Minnesota in January and Ohio State in early February). They may be sliding at the worst time, but hopefully Hardaway, Burke, and Robinson still decide to enter the NBA draft. Illinois was winning at Michigan at halftime, but much like when Purdue was in a similar situation, the wheels fell off in the second half. This broke their five game winning streak, but the next two games are very winnable for the Illini. They may be in good shape to make some noise in the Big Ten tournament and upset a team or two in the NCAA Tourney this month. Although they beat Purdue, Iowa had a horrible loss at Nebraska that may have ended their chance for an NCAA bid. Of course, they could fix that problem by beating IU in Bloomington tonight! Go Hawkeyes! The Boilermakers dismantled a horrible Northwestern team but then couldn't handle Iowa on the road in a game that wasn't that close. Purdue is still pretty bad (and likely won't win another game this season), but they still benefit from some horrible teams rounding out the bottom of the conference. With a big win over Iowa, but a horrible loss at Wisconsin, Nebraska proved that they can challenge the mediocre teams in the conference but still have a long way to go to be a viable threat. The Wildcats are simply horrible after losing a slew of players to injury/suspension this season. This week they lost to Ohio State and got shockingly crushed by Purdue. What a huge week for the Nittany Lions, as they earned their first Big Ten victory against Michigan. Fans should be celebrating in the streets, although with only one conference win Penn State is still definitely the worst team out there. At least they aren't the worst Big Ten team ever!